SAVE, which stands for Students Against Violating the Earth, is an all volunteer group of over 100 high school students from Souderton Area High School. Each year members of this group provide over 1,000 hours of volunteer time in the community. The most popular events include the three community recycling days where over 30 tons of recyclables are collected; a summer camp program that provides over 100 kids with outdoor nature activities; and many other public programs and tours of the Student Environmental Education Campus. With no model to follow or blueprint to use, students of SAVE, took the initiative to research, design, and create a campus which includes a functioning environmental demonstration home called the SAVE House, a solar powered sustainable energy classroom building called CONNECTIONS, and a seven acre nature center on a wooded lot next to the district’s West Broad Street Elementary School. This Student Environmental Education Campus (SEEC) has become a model for student-lead environmental education programs across the nation. It has won numerous awards and was recognized as a winner of the EPA’s Presidential Environmental Youth Award presented by President George W. Bush in the White House. The entire campus was built and paid for by the students and their community partners and is run and maintained by current SAVE members. The campus is open to the public and is the site of many of the group’s activities. The organization has begun a campaign to provide assistance and inspiration to help other schools expand their environmental programs. SAVE members created the LEAP Program (Leadership in Environmental Action) which provides a forum for schools to network and collaborate. About a dozen different schools became involved in its first year and SAVE hopes to expand the program during the upcoming school year. Recently, SAVE members have been challenged to design a way to cool small buildings without the use of electricity. After a year of design meetings with experts in the community, SAVE members on the Solar Initiative Team created a new type of solar chimney which removes the warm air inside a building and replaces it with air cooled by underground pipes. Similar designs worked on by SAVE students are used in a local bank office and a church. A simpler, more applicable design is being approved for use on a new hospital project in Haiti with possible applications in both Central America and Africa. SAVE members hope this idea will become a new standard in third world construction. 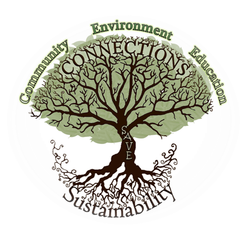 Created by SAVE members as a way for the organization, based out of Souderton Area High School, to connect the three aspects needed to achieve sustainable solutions. By connecting the community, education and the environment, SAVE hopes to partner with the community to create solutions to some of our environmental problems. CONNECTIONS was a project initiated, planned and designed by volunteer students, and completely funded by the SAVE organization. Before the CONNECTIONS project was initiated, previous SAVE students created an environmental education campus on a seven acre vacant lot adjacent to the West Broad Street Elementary School in Souderton, PA. The success of this original project was the catalyst to inspire the current students to elevate the campus into a model of sustainability. They took the initiative to plan a sustainable classroom building and meetinghouse that could hold up to 100 people. SAVE members researched how to design a passive solar building. They solicited the community for funding, volunteering services, and expertise to help construct the building. Over 40 local businesses helped SAVE complete the building. The building alone is an amazing achievement, but SAVE saw it as just the foundation to the CONNECTIONS project. The building helped SAVE reach its first goal of the project: to promote sustainability by modeling it. The passive solar building relies entirely on solar energy generated from two series of photovoltaic cells set up for visitors to see and learn from. The building’s efficient design, sustainable materials, and energy efficient heating system are promoted and showcased to the manypeople come to the site for programs or tours. With the building completed, the students of SAVE could take the lead in guiding the community toward a sustainable future. In 2011, the building and surrounding property was used for over 20 public events. Community meetings; community recycling days; student meetings; a student conference; summer camps; and many other events focusing on the environment were sponsored by SAVE. As a result of CONNECTIONS, the students of SAVE have become the environmental leaders in the Souderton Area communities. Today CONNECTIONS has expanded to include our New Community Sustainability Guide. SAVE members are also working with other schools by sponsoring the annual LEAP Conference (Leadership for Environmental Action Program). Each year schools from across the region gather at SAVE’s campus to learn how to improve their own environmental projects. Please join the students of SAVE by becoming involved in their environmental programs. This website will keep you informed and updated on SAVE’s outreach to our community. The students look forward in working with YOU on sustainable solutions to our local environmental issues.